We've been wondering since last year how exactly Samsung is going to produce a high-definition 720p Super AMOLED screen with a normal RGB matrix, that is rumored to grace its new Galaxy S III flagship. The Fine Metal Mask (FMM) process currently used for AMOLEDs is expensive, cumbersome and doesn't allow for pixels smaller than 15 micrometers, meaning that it can at most top at about 250ppi pixel density, and is what we have on the Samsung Galaxy S II, for example. For an HD screen with this technology, Samsung had to use the alternative PenTile screen matrix arrangement, which allowed it to make the Super AMOLED HD screens on the Galaxy Note and Nexus. We didn't find anything wrong with PenTile at HD resolutions, but screen purists scoff at it, and the competition like LG is advertising their 720p LCD screens with a normal RGB matrix as "true HD", taking a jab at the PenTile arrangement Samsung uses. Well, if the latest report from Korea regarding the Galaxy S III screen is to be believed, companies like LG won't have dibs at the true HD moniker when it comes to Super AMOLED screens any more. Samsung has reportedly managed to introduce the tricky Laser-Induced Thermal Imaging (LITI) production method, which is cheaper and allows for pixels as small as 2.5 micrometers, but until now has not been employed on a commercial scale. 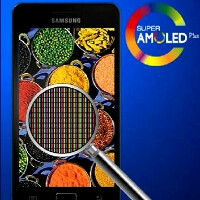 Just as we predicted last year, that 5.5-Gen A2 production line that was supposed to move to Phase 3 production method tests in Q1 this year, will be churning out the 720p Super AMOLED screen with a regular RGB matrix for the Samsung Galaxy S III now in Q2. Moreover, Samsung is reportedly using a combination of FMM and LITI for it - FMM for the blue pixels, since it's the blue that traditionally gave trouble in OLED screens with its shorter lifespan than the other organic LEDs, and LITI for the red and green pixels, resulting in what we hope will be a gorgeous and durable RGB Super AMOLED screen for the Galaxy S III. The panel is reported to be the same one that initially went out on the 4.65" Galaxy S II HD LTE, but done with a true HD RGB matrix, resulting into the sweet 316ppi pixel density, for real this time. After all, Samsung trashed a football field worth of display glass just to achieve the 720p definition on the Galaxy Nexus screen, so we are sure that the new Super AMOLED HD Plus, or whatever its commercial name, will be an image to behold. I wonder what's next... They nailed it all - contrast, color, pixel density, size, durability... What else is there to achieve in screen technology? Transparent, bendable screens are a different thing... There would be absolutely no point in going past 720p on those sizes. Just as pointless as the "new iPad" screen resolution, I suppose. The only way you can tell the difference from iPad2 is by zooming in on something, and even then the difference isn't that great. Nevertheless, the arms race towards better screen will definitely continue as someone wants to have the bragging rights for the "best screen" even though humans wouldn't be able to tell the difference. No. You can easily tell the difference without zooming in. Actually, zooming in makes the difference look smaller. yeah, you can see the difference between 800x480 and 1280x720 only if you put the phone really close to your head... there would be no improvement whatsoever beyond that. but imagine this... a screen of 4,3" of 660x1050 (about 270ppi - enough) that is rolled up on one end and can be pulled out to make a widescreen true full hd 1980x1050 of a tablet size... this is the most realistic use of bendable amoled i can think of. They could give it a better refresh rate so its better for watching video. Actually, I think screens that don't fade in sunlight would be next. That's a big one. Ya know how most cars that have digital displays that are easily seen in direct sunlight, well if they could possibly use something like their technology that solidifies the image depending on the time of day. I have an Infiniti G35 coupe and it has an all digital display and on the center of the dash between the driver/passenger it has another display with compass, temperature zones ect... When the car senses sunlight it does something to the display so you can easily see it even if the sun is shining directly on it. When it's darker, the display isn't as dense. With phones, they have the sensors in the front and could see the sunlight to boost density or something. Even custom video decks for cars are viewable in sunlight. This will be the absolute best screen out on the market hands the f**k down! no iphone is still the best at screen technology. that is what the sheppard said and us sheep need to follow and believe. just believe!!!! click you heels and we will go back to cupertino little toto!!! No, iPhone 4/4S Have A Old LG e-IPS screen witch is good but not best. LG Have Better IPS Screens In Other phones now, and much bigger. really? the SGS1 and SGS2 are the highest selling android phones ever. The galaxy series draws people to it. they look at it, they want it. Its not like an iphone where people want it because "the cool kids" have it. . People want an SGS because its beautiful, powerful, and very functional. It has also lead samsung to overtake apple in over all smartphone sales. Woopsie.
" People want an SGS because its beautiful, powerful, and very functional." since when do you know what people want?.. thats your opinion and nothing more..
G+ you should face booke me too.. since outside PA we should be friends..
You mean the blue pixels will be just as bad as before? And now the green and red ones will be damned as well?? s**t!